Janet Brandt : How big are the bears? 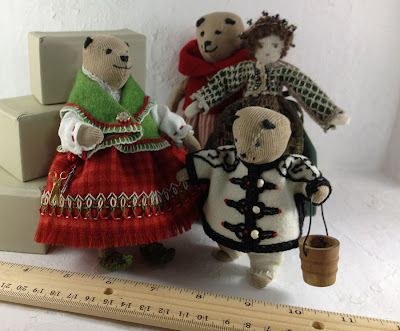 Tiny teddies!I love working small too. These are gorgeous! Once I'm satisfied with the bear pattern I'd love to make them in mohair.Have either of you ever worked with that? Janet, your dolls are adorable! Will Goldilocks also be making an appearance? Stayed tuned for Goldilocks but it may be just a little while!